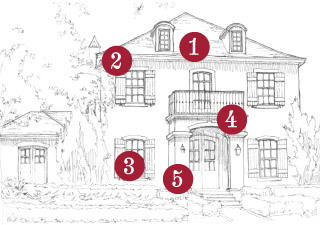 Emerging from the precedents of French domestic architecture, French Eclectic houses reflect the style popularized in the United States during the early part of the last century. These homes evoke the well known French colonial architecture largely confined to New Orleans and its environs following the Louisiana Purchase. The style began to appear more widely in the 1920s and 1930s only to fall out of fashion before emerging once again during the later decades of the 20th Century. The traditional French architectural style is identified by tall, steeply pitched hip roofs which usually flair up just before they meet the exterior wall. 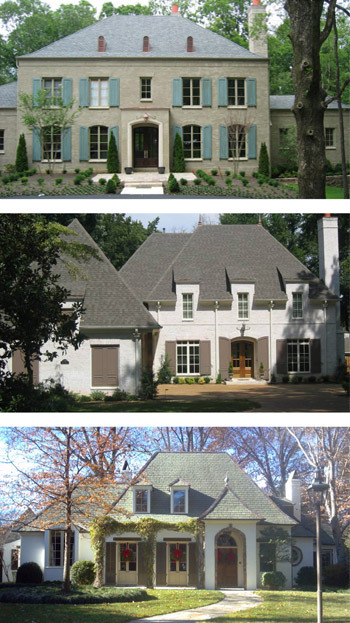 The French style allows for a variety of massing due to its flexibility in adapting to both symmetrical and asymmetrical house plans. In addition to the variety of forms, this style also accommodates a variety of detailing and wall materials, including stucco and stone. Common details include casement and hung windows, shutters, arched window and door heads, and an assortment of dormers and vents. 1. Steeply sloped hip roofs which often flare upward just before the eave. 2. Simplified and shallow projecting cornice and details mimic and reference historical detailing. 3. Openings are vertically proportioned and orderly in their relationship with one another. 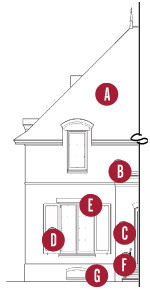 Ground floor windows may be full length and, like the door, may be flat or arched with full size shutters. 4. One story projected entryway or porch may frame the main entrance and will range from simple details to elaborate columns or piers in larger and more ornate homes. 5. Timber, stone or brick columns or piers integrated into the body form. A. Roofing – Architectural dimension shingles, wood shingles, slate or synthetic slate. B. Cladding – Brick, timber, limestone or cast stone, light sand finish stucco. C. Columns – Square timber, brick or stone. D. Shutters – Sized to close over windows, panels, board and batten or louvered mounted with hardware to appear operable. E. Lintels – Brick, limestone, pre-cast concrete, or trim to appear like timber. F. Railing – Decorative black metal. G. Foundation – Masonry brick or stone at main body, solid masonry veneer at porch.